A professional mystery shopper visits your model center as a prospective buyer and covertly video records their meeting with your sales associate, capturing all aspects of the sales presentation. An independent reviewer then watches the entire video and evaluates and grades the sales associate’s presentation on a number of criteria including qualifying, builder’s story, closing, and follow-up. You receive a digital copy of the shop video as well as a PDF report detailing the strengths and weaknesses of each sales associate. We also provide sales team summary reports so you’ll have better understanding of your overall team’s strengths and weaknesses. Unlike other shopping companies who only provide shop reports, Melinda Brody and Company is unique because not only do we specialize in the home-building industry but we also provide a full-service solution with our integrated sales coaching and training services. By utilizing the shop results our sales coach/trainer works directly with individual sales associates and sales teams to improve their sales skills, helping them achieve greater success. So why call anybody else when we can do it all? Efficiently, timely, and most important, effectively so that your sales increase. Written by Melinda Brody and different from any other book you’ve ever read about selling new homes because you’re going to learn how to do everything wrong. Yes, wrong! By stepping into the shoes of SA’s who were a total debacle and experiencing their mistakes, you’ll learn how to do your job far better and make your sales soar. Professionally trained video mystery shoppers visit your model center to shop the sales team. Shoppers are matched as closely as possible to a client’s requested demographic and profile. MB&C’s shop report details your agent’s scorecard results, links to view or download the shop video, and electronic copies of follow up voicemails and emails. When available, we recommend using couples shoppers (e.g. married couple) to enhance the shop’s authenticity. Our shoppers visit your competition and find out everything you need to know about them, including incentives, pricing, bestselling floor plan, financing, etc. To comply with individual state audio/video recording laws, MB&C provides either a written report or video shop, depending on the builder’s location. Collateral material collected during the shop is also forwarded. Our shoppers report the response time after entering a lead on your website or call center and record the phone call that leads to the on-site appointment. MB&C’s report details how the handover to the on-site sales rep is managed as well as electronic copies of phone calls, voicemails, and emails. Professionally trained video mystery shoppers visit your design center with a pre-arranged “contract” and select options for their new home. The option selection process is evaluated using a report that is customized with your criteria. Our shoppers initiate a live chat with your online sales agents to inquire about specific communities, promotions, and other builder information. MB&C’s report details the chat response time and scores the online sales agents on various areas including: soft skills, writing/chatting style, product knowledge, and follow up. Electronic copies of the online chat, follow up voicemails, and emails are provided. After reviewing the sales agent’s shop, MB&C’s Sales Coach and Trainer, Leah Turner, schedules a 50-minute phone coaching session with the sales agent. During the session, Leah and the SA review the video shop. They discuss what went well during the shop, identify areas for improvement, and set up a business goal and 30-day action plan to achieve that goal. You receive a written summary of the coaching session along with a copy of the 30-day action plan in order to hold them accountable. Shop Goals & Objectives: Melinda Brody and Company works very closely with our clients to understand if there are specific challenges or concerns they have regarding their sales associates. Shop Evaluation Scorecard: Melinda Brody and Company’s reviewers grade a sales associate’s presentation using a shop scorecard that awards points to the associate for showcasing certain skills or actions such as registering the prospect or successfully overcoming the prospect’s objections. With Melinda Brody and Company, clients have the option to customize their scorecard to incorporate builder-specific sales processes and other details. Shop Order Form: Clients complete this form providing the work schedules and community information for each associate to be shopped. Prior to sending out shoppers, we have a brief kick-off call to confirm the sales associate’s details and so we’re clear on the client’s shop objectives. Deploy Video Mystery Shoppers: Melinda Brody and Company typically start scheduling shoppers within 10 to 14 days of receiving the Community Overview Form and kick-off call. Depending on client preference, shoppers will target individual associates as walk-in prospects or make appointments. Shop Results: Melinda Brody and Company’s goal is to email clients the shop video and scorecard report within five business days of each completed shop. Copies of the sales associate’s follow-up voicemails and emails are included with the shop report. Post-Shop Debriefing: A Melinda Brody and Company team member reviews the shops results with the client and make recommendations for sales coaching & training. 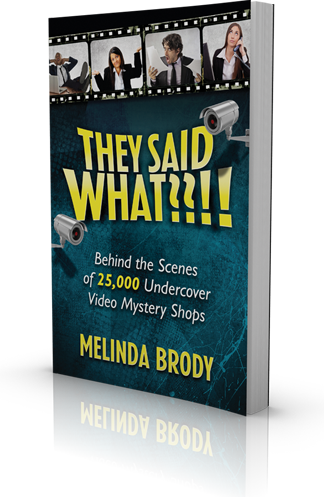 Behind the Scenes of 25,000 Undercover Video Mystery Shops’ - Written by Melinda Brody and different from any other book you’ve ever read about selling new homes because you’re going to learn how to do everything wrong. Yes, wrong! By stepping into the shoes of SA’s who were a total debacle and experiencing their mistakes, you’ll learn how to do your job far better and make your sales soar.